My bump seems to have doubled in size overnight and all I want to wear is loose, comfortable clothing that's effortlessly chic and still "my style". I found this simple t-shirt dress at H&M last week (for $12.95!) and it couldn't be more perfect. It's incredibly soft, has plenty of room for my growing belly and I love that it can be worn alone or layered with a jacket or cardigan. A statement necklace, studded black clutch and cargo jacket were just the accessories I needed to take my outfit from day to night. This dress came in several other colors and I have a feeling that I'll be back at H&M this week to pick up another one! you look really nice, I adore your shoes! You look adorable! Can't wait to see how you continue to style your bump! so pretty and so simple! love the necklace! beautiful look Audrey ! You look wonderful you manage to stay stylish always! I love that necklace! And I bought that dress in green when we went to H&M in Atlanta - it's perfect! So comfy and versatile. you look so gorgeous and your little bum is so adorable! Gorgeous look. What a stylish mama to be! This outfit looks perfect for a growing belly! You are just going to be the cutest preggo ever, m'dear! So excited for you! And loving this cargo jacket! I don't see a bump at all! You look great. i love your pretty outfit, and i need a jacket like that in my life! Love this look! 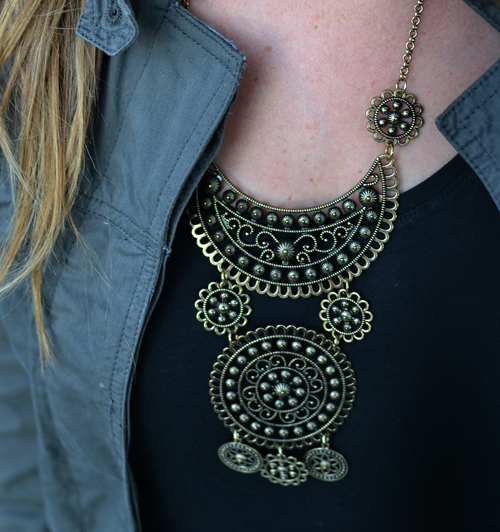 The cargo jacket is the perfect touch, and the necklace is so fun too! Um, what bump?? Seriously you look as tiny as ever! How far along are you now? what a great basic piece...RUN back and get another! that necklace really pulls the whole outfit together beautifully! i can't wait to see your belly at 8mo! and then you will look back and think...i can't believe i thought this was a belly! =) you are adorable! Very cute outfit! H&M has such great sales! Awwwww! :D I love t-shirt dresses too, they're always changeable in style with the right accessories... All the best to you! I love that your keeping to your style even with a growing belling. Such a great easy outfit! i just barely stumbled across your blog! and i'm so happy that i did. i love food and fashion like you do. and you remind me of emily schuman so much! i'm the newest follower. Gorgeous! That necklace looks like it is a part of the dress.. Love it! I can sort of see a tiny bump forming, but it's still hard to tell! You look effortless and beautiful. Great H&M find! Hey no fair...I've been looking for a tee shirt dress like this everywhere (one that's not form fitting lol)...my local H&M doesn't have this item, but maybe i'll have to take a little car ride :) I love the necklace too, I own it and wear it all the time! what?! you are a gorgeous preggers girl! and i love your simple and effortless style! Such a cute look! Love the versatility of the dress! I love how you're dressing up that bump Audrey....timeless yet comfy!! Soooo...who has two thumbs and will be racing to her local H&M today to find this dress to cover her own growing baby bump?! Yes...that would be this girl :) I'll let you know if I find it! And you prob hear it all the time, but you look gorgeous Audrey! Can't wait to see how you style it, Marion! Just FYI- it actually comes with small belt loops and a thin, almost shoe lace like type sash that ties at the waist. I cut the belt loops off and just wear it loose. It's the best! Great way to style the bump! Looking great! Isn't it amazing how it feels like that...all of a sudden..wham..there it is! You look fantastic...and def go grab another color you can style that up and down all early fall! I have a feeling that you are going to be this cute and stylish all the way through your pregnancy. Can't wait to see what you come up with. I'm loving your pregnancy style so far! Can't wait to see more as your bump grows! Love the look, so very effortless. Can't wait to see how you continue to style your baby bump! You still cant even tell your pregnant! You look fab! I love the cargo jacket. how exciting! I didn't even realize you were pregnant! I love this outfit! So cute and simple.